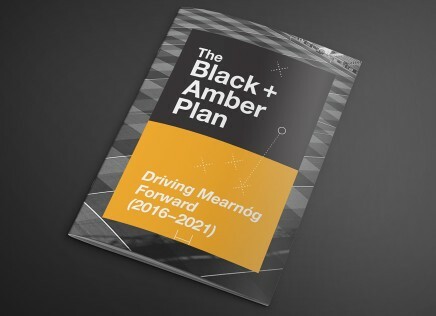 The Black + Amber plan is at half time! Since the townhall, we have embarked on a comprehensive research phase. The response from club members has been brilliant, click here to see a snapshot of the research. There is already great work been completed in these areas, we are looking to build on this work, add in new exciting initiatives and pull it all together into one cohesive plan for the club. We are holding an update meeting on the 3rd of March @8pm where we will go into more details on the process so far and the formation and remit of each working group. We want people to come along on the night, hear about the amazing research results we have and if you are interested, to get involved with one of these key working groups that will drive the future development of our club. There are many positive challenges and some exciting opportunities facing Naomh Mearnog GAA in the years ahead. As a club we need to plan for these challenges and opportunities. The Black & Amber Plan, is a club wide collaborative initiative for every club member will have multiple opportunities to “Have Your Say!! !” on how as a club we should face the future together. The overriding purpose of the plan is to set out a vision where we want to be as a Club in 5 years’ time and outline the necessary steps how we get there. We are holding an update meeting on the 3rd of March @8pm, please come along to find out what has been going on and the next steps in the process.